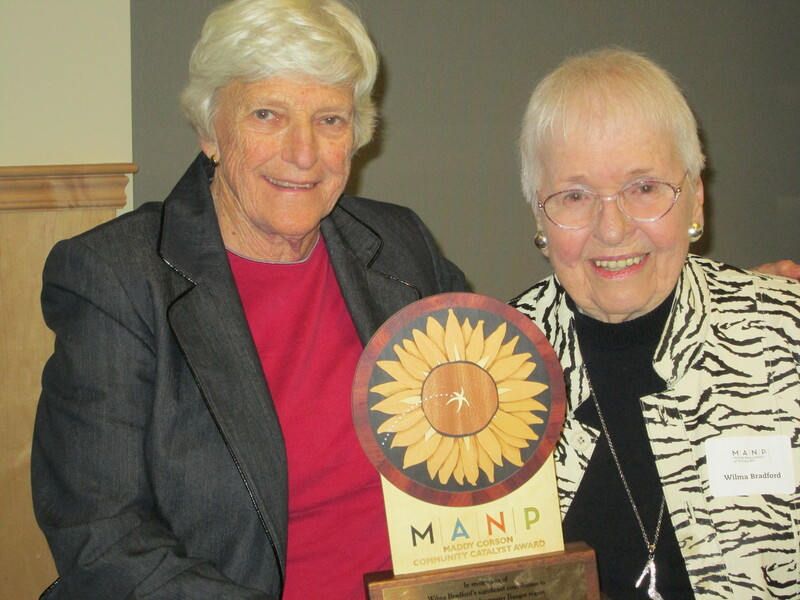 The Wells Conference Center in Orono was filled with party-goers on November 6th, all in attendance to celebrate Wilma “Willie” Bradford, the first recipient of the Maddy Corson Community Catalyst Award. Willie’s commitment to Bangor’s nonprofit community spans decades and touches the entire city. She has served on a multitude of boards and committees, even breaking down gender barriers by serving as the first woman to chair both the United Way of Eastern Maine’s board of directors, as well as Eastern Maine Healthcare System’s board of directors. Bangor’s nonprofit leaders chose Willie above all others as a clear winner for the award due her keen understanding that nonprofits not only enhance communities, they also create community in the process. The Community Catalyst Award was created in 2013 and is named after Maddy Corson, a unique individual with an inspiring legacy of leadership and generosity towards Maine’s nonprofit sector. Maddy Corson herself presented the award, and the community came together to share stories of Willie, her determination to ensure the future of the organizations she cares about, places that continue to make Bangor the vibrant community it is today.